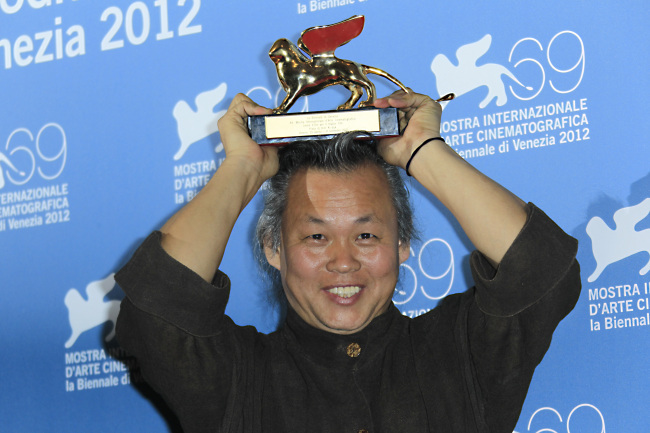 Kim Ki-duk, who became the first Korean auteur to win the top prize at Venice with his gruesome morality tale “Pieta,” has long been considered an “outsider” in the local film industry. From the very beginning, he was nothing like any of the other filmmakers in the scene. He never went to film school, and never worked as an assistant for established filmmakers ― which was considered the “right way” of breaking into the industry. His life story, filled with drama and struggles, however, is nothing short of a film script. Born in Bonghwa, North Gyeongsang Province, to impoverished parents, Kim moved to Gyeonggi Province with his family at age 9. His father was a former military solider who fought in the Korean War, while his mother was a housewife. When he graduated from elementary school, his parents, who could not afford to send him to an ordinary middle school, made him attend an unauthorized agriculture training institution. After spending a number of years at the institute, Kim started working as a mechanic in a factory as a young teenager. He continued working as a factory laborer until he joined the Marines to serve his military duty in his 20s. After being released from the Marines, Kim briefly volunteered for a school for visually impaired children while studying theology to become a priest. A number of Kim’s works, such as “Pieta,” “Amen” (2011) and “Samaritan Girl” (2004), have Christian undertones about salvation and morality ― which may have been driven from his experience during his 20s. In 1990, at the age of 30, Kim moved to Paris without any plans. There, he worked as a street painter while studying art by himself. It was during his stay in Paris that he saw two films that changed his life: Jonathan Demme’s 1991 thriller “The Silence of the Lambs” and French director Leos Carax’s 1991 drama “Les Amants du Pont-Neuf (Lovers on the Ninth Bridge).” “The Silence of the Lambs” was in fact the first movie Kim had ever watched in his life; he had never seen any films in a theater before. In 1993, he returned to Seoul and started writing screenplays. It has been reported that he didn’t even know the spelling system of Hangeul, the Korean alphabet, when he first started writing the film scripts. In spite of the odds, however, he won a film script contest run by the Korean Film Commission for a piece titled “Jaywalking.” The script was never made into a film. Kim released his first feature-length film “Crocodile” in 1996. His early works, including “Wild Animals,” “Birdcage Inn” and “The Isle,” were often called eccentric and disturbing by local critics for their almost misogynist content as well as extremely violent subject matter. He gradually became one of the most significant filmmakers in contemporary Korean cinema, however, after winning a number of awards from prestigious international film festivals. Kim’s works have been noted for their unconventional style as well as for exploring the extremes of the human experience. Kim won the Best Director award at the Berlin International Film Festival for his 2004 drama “Samaritan Girl,” and won the equivalent prize at Venice for “3-Iron” in the same year. Kim disappeared from sight after the release of his 2008 film “Dream,” and did not make any money from “Rough Cut” ― another 2008 film in which Kim participated as its writer and producer ― as its distributor went bankrupt. His 2011 gut-wrenching cinematic self-portrait, titled “Arirang,” featured his perceived failings as a director after going through traumatic events while making “Rough Cut” and “Dream,” and a series of “betrayals” by his colleagues in the film industry. The film won a coveted sidebar prize at Cannes Film Festival last year. “Pieta” is Kim’s 18th feature-length film. It has been reported that Kim, as a young mechanic, used to work at a factory near Cheonggyecheon, Seoul, which makes an appearance as an industrial slum in the award-winning movie.